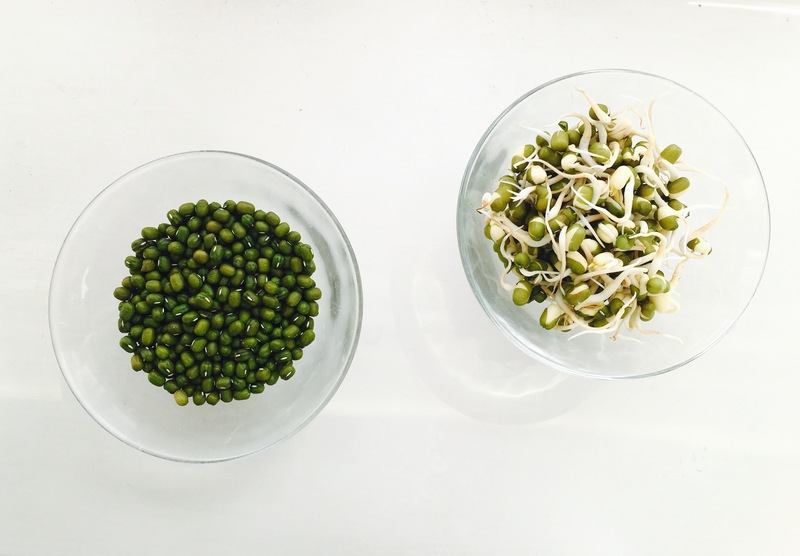 Have you ever tried sprouting any seeds or beans?? If yes, how do you describe your experience?? I find that it’s such a positive and emotional exercise because all you are doing is soaking some seeds that were lying around in your kitchen and letting them be for a day or two, over time you notice the magical power of nature unfold in front of your very eyes! Can you imagine all that potential of the being a plant was saved or locked up in that little dry seed? It has always amazed me 🙂 To me sprouts are a reminder of new beginnings and resilience of life in all its forms, I’m curious to know what they remind you of? Above is a picture taken every morning – how happy it made me to see this progress! Then, after soaking drain all the water and rinse them once, place them in a colander/ or a utensil with perforation. This will allow some air to pass through the seeds and encourage the process of germination. Ensure that you use a plate under the colander to avoid the water from draining out and making a mess of the table/ counter that you’ve stored the beans on. I find that sprouts freeze really well, so if you have made some in excess, don’t worry just put them in a box and straight away into the freezer to add to your recipes later! Great idea. Thank you for the post! I used to grow my own years ago, but somehow lost the essentials for making this healthy option now. Ohh no!! Well I hope you find them! 😀👍I’m sure you won’t! Hehe!! This really made me chuckle, thank you!